Before hitting Instagram and the local farmers markets, I had no idea all of the amazing food you could purchase from local businesses in Sacramento. One of the first companies that I talked about working with is Midtown Jerky Co. I was super new to the scene but Ryan from Midtown Jerky Co, was super nice and wanted to work with me, saying that we could help each other. First, let me say that I LOVE jerky. I always have some in the pantry for when I need a high protein snack. I pack in on road trips, take it on vacation with us, and at almost any given time will have jerky on me. I buy all different types of beef jerky. I'm a jerky enthusiast. I, somehow did not know that I could buy LOCALLY made jerky. Midtown Jerky Co. is a small batch artisan jerky company that only uses the finest meat and ingredients in their product. Ryan sent me 3 packages of beef jerky to review which made me super happy. I'll start with the Peppered jerky. Peppered is usually not my preferred choice when picking a jerky flavor BUT I think Midtown Jerky Co's peppered is my favorite. It's not your typical peppered jerky. This jerky has an overtone of savory matched with sweetness, then it's loaded up with course black pepper. It's smoky, chewy, and a perfect snack for any time. Last but not least is the Sesame Citrus. I like that Midtown Jerky Co. has a unique offering for people who don't like spiciness. Most companies do a teriyaki which I love but it's always nice to have flavor options. This jerky has the most rounded flavor since you get that orange juice bringing a nice twang to the jerky. It's salty, sweet, and you get pops of both flavor and texture from the sesame seeds they sprinkle on the jerky. Overall, I LOVE Midtown Jerky Co. and I'm excited to be able to buy some local jerky for my snacking needs. I just wish they had resealable bag since I try really hard not to eat it all in one sitting. I just popped mine into a zip top freezer bag after I opened it and it stayed fresh. 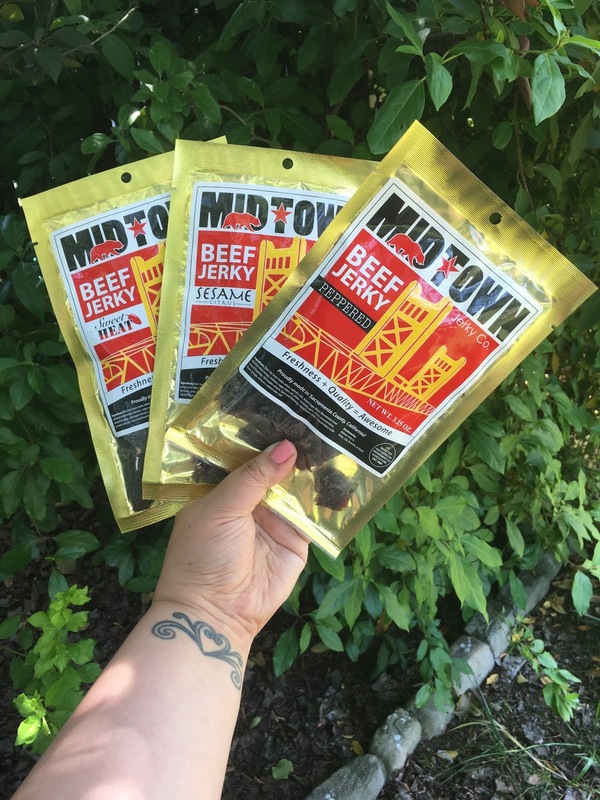 You can find Midtown Jerky Co. at SaveMart grocery stores in the Sacramento area, at farmers markets around town, OR you can order online from Midtown Jerky Co.'s Online Store. You can also find them on their Facebook, Instagram, or Twitter.